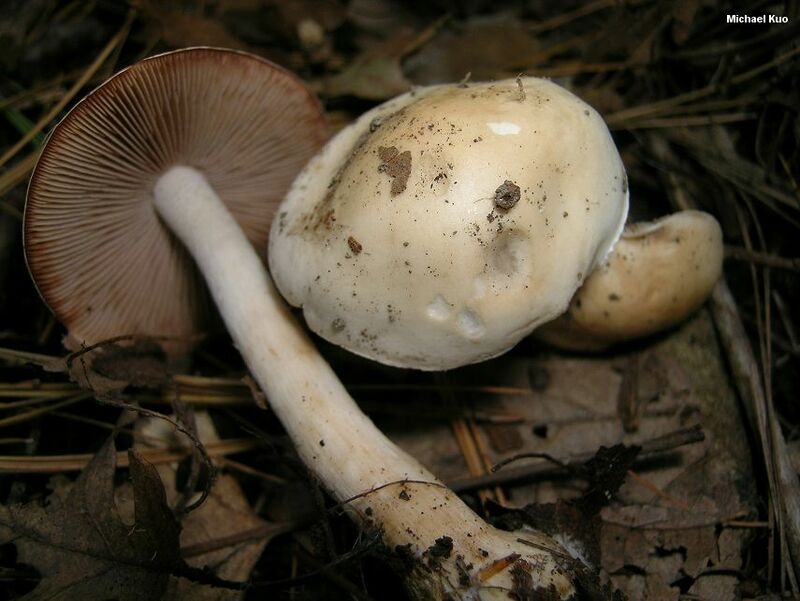 Associated with hardwoods in eastern North America, this rarely collected species of Hebeloma has a long, skinny stem and a white cap that remains whitish throughout development. It appears to belong to a confusing and poorly documented group of species centered around Hebeloma sarcophyllum, which is also white but features gills that develop pink shades as they mature, and smaller spores. Hebeloma album, another whitish species, has larger spores. Ecology: Mycorrhizal with hardwoods (possibly also associated with berry bushes); growing scattered or gregariously; fall; east of the Great Plains. Cap: 2.5-7 cm; convex, becoming broadly convex, broadly bell-shaped, or nearly flat; sticky when very fresh; bald; white to off-white when fresh, but sometimes discoloring yellowish with age. Gills: Attached to the stem, often by a notch; close; white when young, becoming cinnamon brown to brown. Stem: 4-8 cm long; 3-7 mm thick; more or less equal, or not infrequently with a small basal bulb that may be buried underground; silky to finely scaly near the apex; whitish. Flesh: Whitish in the cap; brownish in the stem. Odor and Taste: Radishlike, or not distinctive. 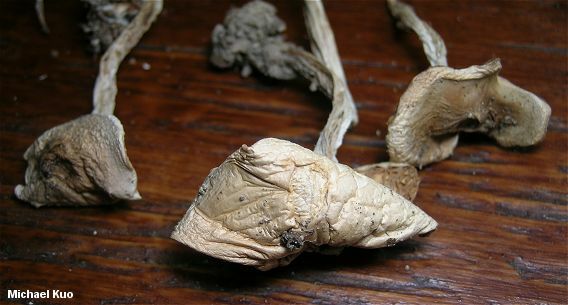 Dried Specimens: Cap and stem remaining off-white. Chemical Reactions: KOH negative on flesh. Iron salts negative on base of stem. Spore Print: Brown to reddish brown. 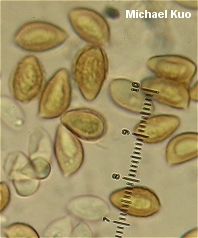 Microscopic Features: Spores 9-12 x 6-7.5 µ; almond-shaped; finely verrucose; occasionally with a loosening perispore; weakly dextrinoid. 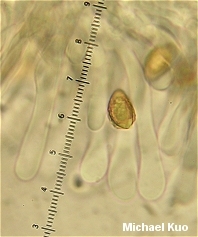 Cheilocystidia 30-110 x 3-7 µ; abundant; generally cylindric, subclavate, or clavate, but occasionally subutriform with an elongated cylindric extension. Pileipellis an ixocutis. 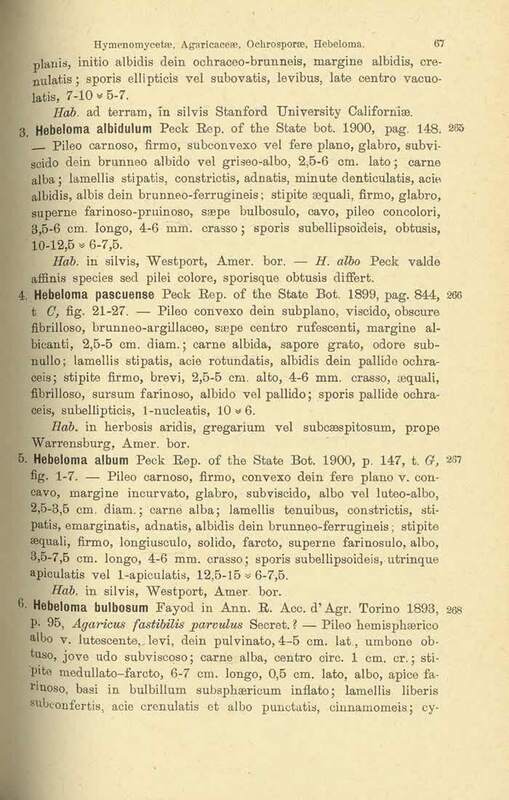 REFERENCES: Peck, 1900. (Saccardo, 1905; Kauffman, 1918; Smith, Smith & Weber, 1979; Smith, 1984.) Herb. Kuo 10130901.